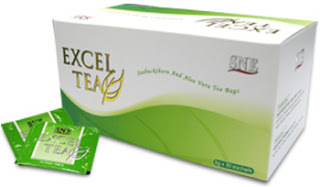 SNE Excel Tea is made from natural plants such as hawthorn fruit, corn stigma, seabuckthorn leaf and aloe vera which are beneficial to the human body. Its active nutrient substances are extracted using modern technology, and are unpolluted, without any known side effects. It is capable of removing toxins and heavy metals from the body, which will help reduce pigmentation, promote a radiant complexion, eliminate excessive fat and improve overall health. Hari pertama akan buang air besar 4 ke 5 kali. Setengah orang hanya keluar angin, dan bila sudah seminggu baru buang air kerap. Biasanya pesakit gastrik. Rendam dengan air suam dalam sejag besar. Minum seisi keluarga tambah air sehingga warna air jernih. Buang uncang teh atau letak kat mata atau buat baja atau makan serbuk teh. Fructus Crataegus Pinnatifida, Stigma Maydis (Maize Silk), Hippophae Rhamnoides Lleaf (Seabuckthorn Leaf) and Aloe Vera.